The region's independent science panel briefed the Northwest Power and Conservation Council April 9 on its review of Oregon's spring spill proposal, a controversial action proponents claim could boost ESA-listed salmon and steelhead stock returns by 350 percent and reach recovery levels set by the region's fish and wildlife program. The proposal calls for a 10-year test that boosts spring spill at federal dams on the lower Snake and Columbia rivers enough to raise total dissolved gas levels to 125 percent or gas caps in dam tailraces, and then monitors survival compared to the current court-ordered spill program. Current levels are limited. The proposal has already been panned by National Marine Fisheries Service and BPA consultants for confounding correlations between freshwater and ocean survival, but its supporters--the state of Oregon, the Nez Perce Tribe and some environmental groups--have pushed it as a new amendment to the region's fish and wildlife program. The review by the Independent Science Advisory Board (ISAB) that came out in late February echoed many of the previous criticisms that were voiced to the Council in January by the Corps of Engineers and John Skalski, a University of Washington statistician and BPA consultant. Even NMFS dissed the spill idea and explained why in its 2014 hydro BiOp that also came out in January. The ISAB report found the proposal lacked an adequate hypothesis and detailed study plan, and failed to consider the effects of ocean factors and how many years were required to produce robust statistical results. Critics like Skalski said it would take many decades before any real results might be produced, depending on what kind of controls were developed. The spill test would not be cheap. BPA estimates it will cost about $110 million a year to implement, a financial hit that would increase the direct fish and wildlife budget by nearly 50 percent. But despite the board's critical findings, ISAB member Greg Ruggerone told the Council April 9 that if the spill advocates satisfied critics by developing a study plan and a design that maximized learning potential, the "experiment" could enhance knowledge about spill, salmon survival, and adult returns. But those are big "ifs," said some stakeholders who listened to the presentation in Spokane and groused later that the ISAB muted its own criticisms of the spill test. Bo Downen of the Public Power Council said he was surprised the ISAB soft-pedaled the serious questions raised about the proposal in its own report. Another ISAB member, U.S. Geological Survey researcher Alec Maule, explained potential problems to fish encountering higher spill and increased gas supersaturation, and how the current smolt monitoring system examines fish for signs of gas bubble disease. His presentation also included information from the Fish Passage Center that showed 2011 TDG levels at Lower Granite Dam in the Snake River were over 125 percent for a six-week period, when many fall Chinook smolts were migrating downstream. The FPC also noted the 748,000 upriver bright return two years later. "Subsequently, in 2013, as you know, we had a record return of fall Chinook salmon, and many of those fish would have been migrating during these very high gas supersaturation conditions that occurred in the Snake River. The one thing that we don't know, though, is perhaps we would have had even higher returns had there not been high gas at that time." No one mentioned that the spring spill test is aimed at improving spring Chinook returns, but juvenile survival of spring Chinook in 2011 was below average, compared to other recent years with lower flows and spill levels. Adult upriver spring Chinook returns two years later added up to about 123,000, way below the 10-year average of 170,000, and the third lowest return of the previous 14 years. 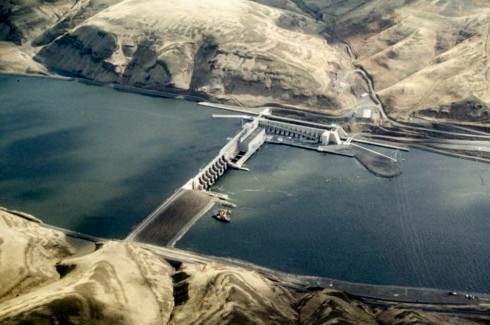 Maule said some yet-unpublished research suggests that smolts subjected to gas supersaturation below Bonneville Dam in 2011 suffered higher mortality rates in the Columbia River plume. Maule said if the spill proposal is put in place, then increased monitoring would be needed. Council members, who will ultimately vote whether or not to include the spill proposal in their updated F&W program, peppered Ruggerone with questions after the presentation. NPCC Chair Bill Bradbury, one of Oregon's members, asked what it would take to develop a hypothesis of the experiment, a process he had been told would take six to eight months (the amended F&W plan is expected to come out in draft form by the end of April and be adopted by late summer). Ruggerone said peer review by the UW's Skalski and others could take a lot of time. "Depending on who you are talking to," said Bradbury, "the spill experiment is the worst idea ever invented, or a really sound experiment with only a few questions left to be answered." Oregon's other Council member, Henry Lorenzen--who served on his state's water quality commission in the 1990s, when dissolved gas issues were hotly debated--raised issues about the current accuracy of the gas bubble monitoring program. Noting that only 5-10 percent of the juvenile fish are passing through turbines now, Washington Council member Tom Karier questioned how fish returns would double or triple by simply adding more spill. "For us, it's not just a matter of a good experiment. We have to have some sense of a likelihood that the theory is true--because you don't do a billion-dollar experiment if it's a long shot." Corps of Engineers' fish survival data presented to the Council in January showed evidence that more fish are passing most dams via spill with less volume of water than previously thought. It's nearly a 2:1 ratio in most cases, but a point that is disputed by spill proponents, whose own Comparative Survival Study (CSS) analysis still maintains that fish passage and water volume follow a 1:1 proportion, an assumption nearly everyone accepted in the 1990s before extensive dam modifications began. Idaho member Bill Booth also questioned whether the correlation/causation issue could ever be settled through this experiment. When ocean conditions are good, freshwater conditions usually are as well, making it especially hard to separate effects on fish survival. On April 8, the Council heard from several utilities on the impact that implementation of the spill proposal would have on their rates. Steve Eldrige, general manager and CEO of the Umatilla Electric Cooperative, said any reduction from BPA will likely require his utility to replace it with fossil-fired generation and have an 8-percent to 10-percent rate impact on its wholesale cost of power. Fred Rettenmund, from Inland Power and Light, said 15 percent of his utility's total cost already goes to fund BPA's F&W program, and "We would suggest that there's as much opportunity for looking at what we already have and how we can do it better and more efficiently, and not at the margin looking at what new things can be added to the program as well."